It is with great pleasure that the Nunawading CC committee advises the awarding and presentation of Life Membership of our Club to Paul Callanan. Paul is a legend and Life Member at Blackburn Cricket Club where, amoung other contributions, he started the, now very large and successful, junior program. Paul’s contribution to Nuna started in the early 1990’s when he moved closeby. Soon after joining, Paul found himself behind the bar and, for over 15 years, opened and ran the bar on Tuesdays, Thursdays and Saturdays. He also served and cleared up after afternoon tea each Saturday. Paul was a major contributor to the kitchen redevelopment in 2005 and was Best Clubman on multiple occasions. 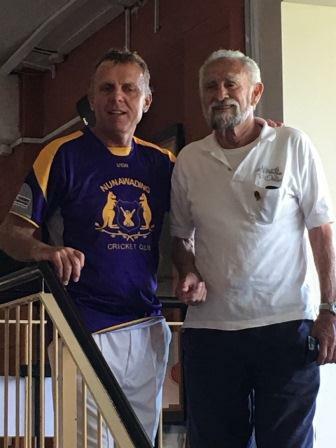 Congratulations Paul, you are now a Life Member of Nunawading Cricket Club.